The effects of tooth decay may have a greater effect on health than previously thought. According to a study published in the online version of the medical journal Pediatrics, tooth decay may actually push back growth in children! The study was conducted at University College London and King Fahd Armed Forces Hospital in Saudi Arabia. Researchers looked at the link between oral health and growth in children after previous studies failed to show any definitive results. The study observed whether or not there was a correlation between height and tooth decay in a group of Saudi Arabian children aged six through eight. The oral health of each participant was determined using the DMFT index—a scale that determines the total number of teeth that are decayed, missing or filled. The team determined that there was indeed a relationship between tooth decay and low height and weight. The children who suffered from severe tooth decay were more likely to be underweight and shorter than their peers. Even when demographics and social values were factored in, the link between stunted growth and tooth decay still existed. While more research is needed to confirm the study’s findings, the Canadian Dental Association recommends that parents schedule their child’s first dentist appointment within six months of the first tooth appearing—typically around a child’s first birthday. 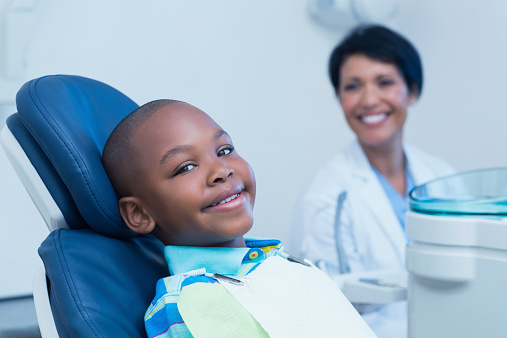 As your child grows, the dental regime should include two annual visits to a dentist. Poor oral hygiene can have a negative impact on a child’s health, as it can lead to malnourishment and bacterial infections requiring hospitalization. The pain of tooth decay can also lead to problems eating and speaking and can affect your child’s learning. As a provider of dental services in Toronto, Princeview Dental reminds parents of the importance of their children brushing, flossing and rinsing with an antiseptic mouthwash at least twice a day from an early age. To preserve good oral health, children should also maintain a healthy diet that’s low in sugar and high in fruits and vegetables. We will work with you to create an oral hygiene routine for your child and make sure that they are brushing and flossing properly. The best times to brush are first thing in the morning then again at night before they go to bed. A toothbrush featuring your child’s favourite cartoon character can encourage your little one to brush regularly. Princeview Dental also realizes that going to the dentist for the first time can be a scary experience for a child. We not only provide expert dental services in Toronto in a relaxing environment—our dental hygienists specialize in providing dental care for small children. Contact us today for more information.